You can find my latest (and last, for now) column in the Kansas City Star by following this link. Recently Brinton has entered the separation anxiety phase. When we leave him with someone else he cries with an expectation of our return. I strongly believe he needs to learn to be taken care of by others, so it doesn’t pain me to leave him at the nursery at church or with a babysitter. But if we leave him in another room at a friend’s house with someone else and he begins interrupting by endless crying we have to intervene. And I’ve noticed that there’s something intoxicating about the power to calm his cries down. The feeling of being needed is addictive, so I can understand why some parents incessantly come to the defense of their kids. I think that even at the age of one, it’s something I need to fight, because if I get addicted now, it will be too easy to try to fight his battles for him later. Obviously I need to come to his rescue if he’s really in trouble, and I need to shower love on him at times every day. But even at this age he and I both need to learn that I can’t always rescue him from situations he deems uncomfortable. I just wish it was easier. Any thoughts? 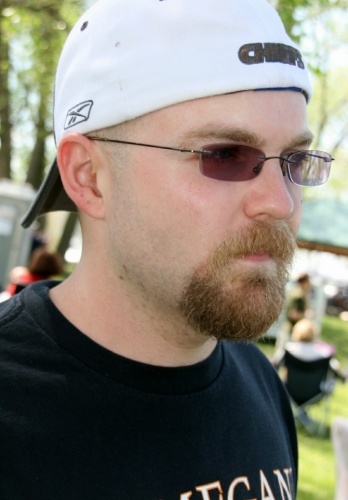 A photographer from the Kansas City Star took this picture of me at the Parkville Microbrew Festival last Saturday. I was having a conversation with a fellow beer enthusiast I had just met, and wasn’t aware the picture was being taken until afterwards. I just want to say if I’ve ever talked to any of you and you thought I looked mean, I apologize. I will try to work on that.